The best microwavable breakfast product of the year! These omelettes don't taste like they came from the microwave. They taste like they came from the kitchen of a really good restaurant. The eggs are fluffy and the fillings are plentiful and loaded with flavor. If other companies follow Cedarlane's lead, this could be the dawning of a new day for microwave breakfasts! 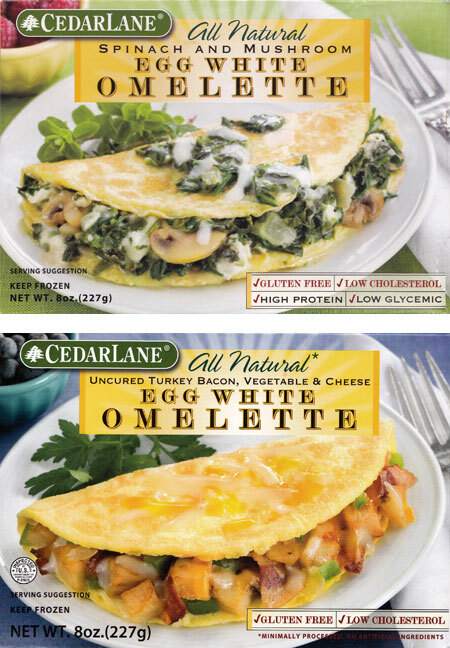 I tried two varieties of Cedarlane Egg White Omelettes: a spinach and mushroom variety and an uncured turkey bacon, vegetable & cheese variety. The spinach omelette was the better of the two. You know those commercials where a grocery store product is placed next to a homemade dish in a blind taste test? I never believed them. "Oh sure... no way that canned soup is as good as that guy's mom's soup... I don't believe it." This spinach omelette has wiped away my skepticism. Seriously, if this omelette was placed in blind taste test next to 80% of the spinach and mushroom omelettes I've had at restaurants across the U.S., this microwavable product would win a significant number of times. The spinach tastes remarkably fresh and there's just enough cheese to make the healthy ingredients taste fairly indulgent. As for the turkey bacon variety... while it's a good product, it does seem more like a microwavable product. The bacon doesn't taste particularly like bacon. It's more of a somewhat pleasing general breakfast meat flavor. The vegetables in the omelette taste fresh and it's cheesy enough to be called "cheesy". My biggest complaint would be the slight pool of liquid that remains at the bottom of the container after the cooking process. That did not happen with the spinach variety. The instructions for both omelettes are simple... microwave for three and half minutes. That's it. While both omelettes are marketed as "gluten free" and "low cholesterol", you should be aware that saturated fat content of these products is somewhat higher than their homemade equivalent. The spinach omelette has 6 grams of saturated fat and the turkey variety sports 7 grams. Both omelettes offer over 45% of your recommended daily amount of protein. Right now, these omelettes are a little over priced... about $4.00 each where I bought them. If you can get the spinach variety for under $4.00, I highly recommend giving it a try. 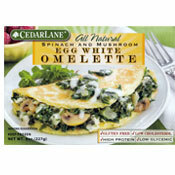 What do you think of Cedarlane Egg White Omelettes? I dig the green chile one... it must be a newer flavor. My husband loves the spinach mushroom kind. Hard to find in our stores. I read Mr Breakfast's review of the mushroom and spinach omelet after I tried one. I think that he has lost quite a few of his senses. 1)It had a taste of onion mixed with limp collards. No egg flavor at all. 2) It smelled of processed ingredients and onion power. 3) The mouth feel was that of a very thin flip flop.It did look good on a plate and the squeak the egg made when I bit into it sounded pretty cool. I eat the broccoli and cheese omelet every morning... and it is delicious! The only one I eat. Haven't tried the others and probably won't. Took two bites and couldn't eat any more. Way too salty. I tried the spinach and mushroom one and it actually made me physically ill. I was pressed for time and wasn't able to heat up a different breakfast so I trudged on and managed to finish it. That was a mistake because I felt nauseous for an hour afterward! I can't believe anyone would have anything good to say about this omelette. I've tried the Jimmy Dean cheese omelettes and they are a world better than this one, albeit much more unhealthy. Mix together a mound of unseasoned sauerkraut and chopped up Swiss chard (which is what the spinach tasted like, for some reason) and sprinkle it with garlic and onion powder. Then melt in a smidgen of mozarella cheese which was EXTREMELY bland and tasteless, a funny choice since apparently onions are the third ingredient in this dish. There is a TON of onion flavor, and to add onion powder and garlic powder adds insult to injury. It was one thing to have the gross puddle of water at the bottom, it was another to have MOUNDS of the repulsive filling over the fake egg taste. I actually only ate half of the filling and there was still a ton of filling, proportionate to the egg. The very best compliment you could give this meal would be to say that it tastes like spanakopita. I think that's the flavor that the manufacturers were going for. Unfortunately, they missed the mark...by quite a bit. In conclusion, don't waste your money (over $3.50!) on this horrible microwaveable breakfast. I tried the Egg White Omelette with the uncured turkey bacon, vegetable & cheese tonight. I agree with the reviewer that there is a pool of liquid left over. I thought the egg tasted pretty good considering that it came from a microwave. I thought the green peppers were overpowering the entire dish. I still have an aftertaste of them as I write this. I'm not exactly sure why the flavor was so strong because there didn't appear to be a lot in the dish. The cheese was a bit oily and the turkey bacon was okay too. Overall, it's pretty good but I think it's a tad expensive at $4. I think it should be $2.50 or $3. I think the spinach and mushroom would have been the better selection to review. The uncured turkey bacon, vegetable & cheese egg white omelette seems to be too ambitious. Hi Don... here's a store locator from the company... type in your zip and hopefully it will show some stores near you... good luck! I've been looking for these at the supermarket but I haven't found any here in Orange County. Do you have to go to a place like Whole Foods to get this?